Business to business (B2B) applications are set to create more value from the Internet of Things than pure consumer (B2C) applications. Or so says recent research from McKinsey which suggests that 70% of the value of the IoT market will come from B2B. Manufacturing industries, especially high-volume facilities are leading the charge. Out of the nine settings McKinsey explores, the ‘size of the prize’ is bigger for factories, than for any of the other settings. 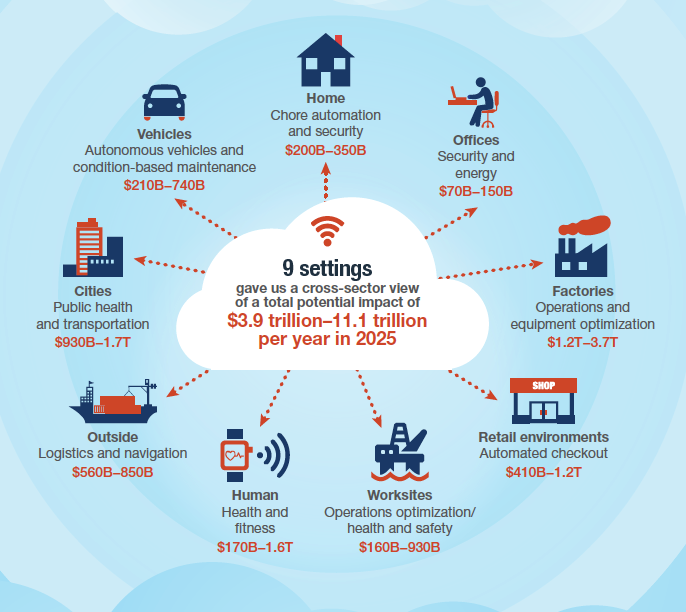 According to McKinsey, the adoption of the Internet of Things within factories has the potential to generate an economic impact between $1.2 Trillion to $3.7 Trillion per year. They suggest that any standardised production environment could be set to win big from productivity improvements – including 10-20% energy savings and 10-25% potential improvement in labour efficiency – plus extra gains via preventative maintenance, inventory optimisation and worker health and safety. In practice, factories are indeed leveraging sensor data and advanced analytics to increase yield. Early identification of process or product problems allows early correction, reducing defects and resulting in efficiency gains. Plus processes with variable elements such as temperature or pressure and industries that require precision placement of components all have the opportunity to harness data insights in order to run smarter than their competitors. The study shows that manufacturing is driving Industry 4.0. Whilst the name might sound somewhat gimmicky, the reality is that enhanced monitoring and control capabilities in production environments from IoT are set to drive a sea-change that will exceed the impact of the first industrial revolution and provide a catalyst for innovation and transformation that will leave no business untouched. But being one of the first on the uptake for new IoT technology and being a leader of the revolution that is Industry 4.0 is something of a double-edge sword. Granted, being first does potentially create competitive advantage, via lower operating costs, the chance to win new customers and achieve greater asset utilisation. But it comes at a cost. Early adopters have to tackle the challenges of achieving Industry 4.0 performance head on – they will wrestle with issues of security, infrastructure, interoperability and building the capability to act with agility to drive action from data-delivered insights. Later adopters may be able to gain those same benefits at lower cost, bypassing the pitfalls encountered by their first-mover counterparts. But irrespective of whether companies pursue leader or laggard strategies - and there are pros and cons to be had with both - ultimately IoT improvements in manufacturing and industry will drive progress for all. Why? Because the improvements delivered by leaders will inevitably have an impact on end-customer (or user) expectation – better quality, more features, more value and better products and services. So that in the end, any provider who fails to deliver against these raised expectations will do so at their peril. In light of these facts, we predict that in time, the ability to implement and manage high-impact IoT innovation will become table-stakes in production industries. The knock-on effect being that long-term, sustainable advantage will become the preserve of those who use the Internet of Things in novel ways, revolutionise their business models and make themselves hard or impossible to copy – thus conferring all-important competitive advantage. Ability to deal with data – at volume and velocity. For us at Breed Reply, it is this final point that holds the most power. As an early stage investor in IoT businesses, we seek out the most disruptive technology innovations in the market and provide funding and support to accelerate their development to launch and beyond. Our portfolio currently comprises 20 IoT companies with several playing squarely to the needs of industry. They include: Senseye, a diagnostic and prognostic monitoring solution to improve production performance; Tag Sensors, delivering cold-chain logistics solutions to both food and pharmaceuticals and Metron, providing a Platform-as-a-service solution for energy management in industrial settings. Three UK has ramped up efforts to thwart fraudsters and protect customers by partnering with authentication specialist CallSign. Zeetta Networks have been selected for the ‘Disruptive Innovation Award’, one of the globally prestigious TMF Excellence Awards, for NetOS Rapide. The powerline communications specialist is now a one-stop shop for controls, data analysis, and lights, in a new “one throat to choke” strategy.